So far as I can tell, only Professor Kerr and I replied. He wrote: "I've thought a lot about this issue in the last year; I'm a lot more aware of the problem than I used to be. I'm mixed on the merits of announcing a policy, though, as compared to pushing organizers to think about range of voices if the issue comes up." Whoever manages the Twitter feed for FLP responded positively to that. My reply was as follows: "That's certainly a commitment I have in ORGANIZING panels (of more than, say, 2 people); with Orin, it's something I'm happy to push w/r/t panels to which I'm invited." After a short exchange, I promised to blog about the issue, which I'm now doing. I confess that when I first saw the tweet, I was puzzled: Why, I wondered, is this a commitment to be undertaken only by men? I then realized: Duh, because a female panelist doesn't need to. 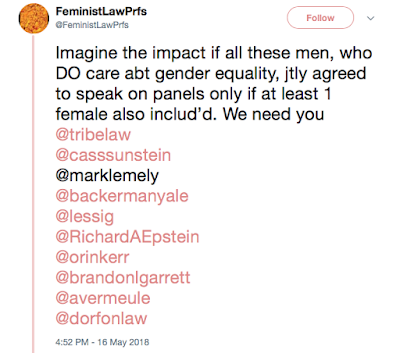 If the idea is to ensure that there is at least some gender diversity on each panel, a woman who agrees to serve on a panel provides the minimal diversity herself. So this is not a case where allies are being asked to be out front. 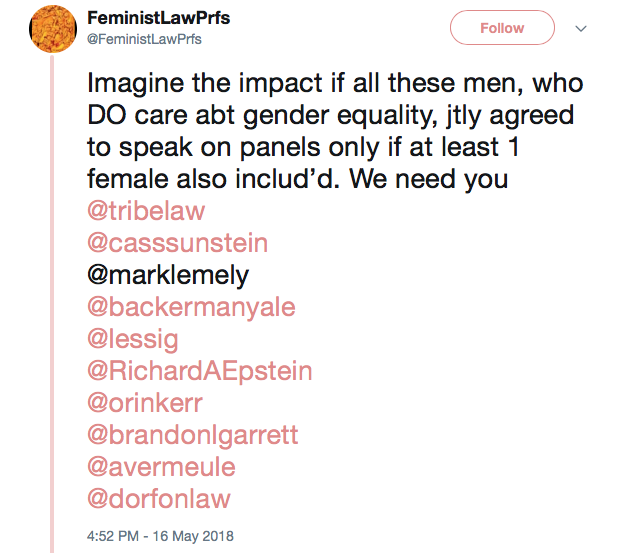 As Prof. Kerr's reference to a "range of voices" indicates, gender diversity is only one kind of diversity about which one ought to care in putting together an academic (or other) panel. I would put racial/ethnic diversity and intellectual/ideological diversity high on the list as well. Other kinds of diversity are also valuable. Sexual orientation, gender identity, veteran status, disability, and a variety of other characteristics can inform one's perspective on particular issues, and even when they don't, visibility for people who are members of traditionally underrepresented groups has value. Ideally, every panel will include some people who hold a range of views on the question for discussion and who come from a variety of backgrounds. However, the ideal panel size might be too small--a moderator and three speakers, say--to represent all relevant perspectives and backgrounds. Accordingly, a commitment to gender, racial/ethnic, intellectual/ideological, and other kinds of diversity should not be so rigid along any one dimension as to preclude emphasizing one or another kind of diversity. That leads me to want to qualify what I tweeted. When I said I have a "commitment" to gender diversity in organizing panels, I may have overstated my past practice, which is to try very hard to ensure that any panel I organize is diverse along multiple dimensions. I would not be surprised, however, if I have occasionally failed along one or another dimension. I'm willing to commit to trying harder in the future, but I don't know that a strict rule rather than a strong presumption is the best way to get there. As to speaking on panels organized by others, I want to raise a little bit of doubt about the premise that doing so is always welcome. I turn down a fair number of invitations to speak on panels, for a variety of reasons, including: it's on a topic that never interested me that much or used to interest me but no longer does; it's in a distant city that would require me to take three days away from family and work (one day to travel there, the day of the event, and one day to travel back, because Ithaca is two planes from everywhere other than Philadelphia, Newark, and Detroit); the organizers want me to write a paper that does not fit into my writing agenda; etc. Still, I almost always feel bad about turning down invitations to speak at academic conferences, even when I know I really don't want to accept, and so I end up accepting some invitations that I really ought to have turned down. Perhaps that's just my own odd psychology, but I suspect it's true of others as well. To the extent that white male faculty start turning down highly desirable speaking engagements to make way for women and under-represented minorities, or use our leverage to increase the number of invitations to the latter, that's great. But I imagine that one unintended side effect of serious efforts to diversify academic panels will be to overload members of some under-represented groups in ways that actually burden them. There is evidence that female faculty shoulder a greater burden of service on committees and the like than their male colleagues, just as faculty of color perform additional "invisible labor" advising minority students. It is easy to see how some of this arises innocently. A dean wants to ensure that various faculty committees have diverse perspectives, but the faculty has not yet made sufficient progress in diversifying its own membership to allow the dean to do so without imposing extra burdens disproportionately on the stretched-thin female and minority faculty. Yet even if the phenomenon arises innocently, its effects can be invidious, as service tends to garner fewer tangible rewards than scholarship. Serving on an academic panel occupies something of an in-between space. Presenting a paper one is already working on provides opportunities for useful feedback and garners exposure. But there can be a point of diminishing returns beyond which you either end up repeating for a new audience something you've already said before or getting distracted from your own scholarly agenda. Conventional wisdom says that pre-tenure, faculty should not write more than a very small number of papers just for symposia; my view is that this rule should apply post-tenure as well, unless the symposium provides an opportunity to write on a topic on which one was planning to write anyway. If I'm correct about that, then additional opportunities to present on academic panels for women and faculty of color could be a double-edged sword. They will need to be protective of their own time and scholarly agendas in judiciously declining those invitations that would impede rather than advance their careers. Clearly the long-term solution is to boost faculty diversity in general, so the burdens (and benefits) are naturally spread more evenly. We might defend the choice I've just described by analogy to the "designated public forum" doctrine in free speech law. It's not censorship to exclude from a discussion of immigration policy someone who wants to talk about the influence of Haydn on Mozart, regardless of how erudite and interesting the music historian would be. It's simply a matter of keeping to the subject. But I want to go further to say that even when a speaker would stay on-topic, broadly defined, there can be good reason to have an ideologically skewed panel--especially if the skew runs counter to the dominant approach. Relatively small disagreements or disagreements about tactics or strategy among people who support the same broadly defined long-term goals can produce important discussions; those discussions can get derailed if someone who completely rejects the long-term goals wants to shift the conversation to those goals. To borrow a term coined by Yale Law School Dean Heather Gerken in discussing institutions, some intellectual/ideological homogeneity on particular panels is a kind of "second-order diversity" that, in the aggregate, promotes intellectual and ideological diversity. That is far and away the best treatment of this topic I've come across: thank you.